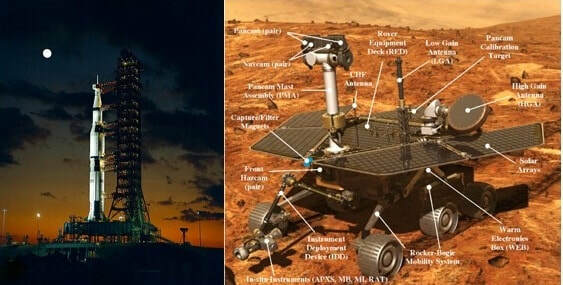 Space Exploration - Welcome to Our Generation USA! Below, we cover Space Exploration, from early astronomy to the first satellite launch, including manned space travel and moon landings, Mars and other destinations, as well as the space shuttles and the International Space Station, including Earth-bound Planetariums/Observatories. Space exploration has often been used as a proxy competition for geopolitical rivalries such as the Cold War. The early era of space exploration was driven by a "Space Race" between the Soviet Union and the United States. The launch of the first human-made object to orbit Earth, the Soviet Union's Sputnik 1, on 4 October 1957, and the first Moon landing by the American Apollo 11 mission on 20 July 1969 are often taken as landmarks for this initial period. The Soviet Space Program achieved many of the first milestones, including the first living being in orbit in 1957, the first human spaceflight (Yuri Gagarin aboard Vostok 1) in 1961, the first spacewalk (by Aleksei Leonov) on 18 March 1965, the first automatic landing on another celestial body in 1966, and the launch of the first space station (Salyut 1) in 1971. ​The Hubble Space Telescope (HST) is a space telescope that was launched into low Earth orbit in 1990 and remains in operation. Although not the first space telescope, Hubble is one of the largest and most versatile, and is well known as both a vital research tool and a public relations boon for astronomy. The HST is named after the astronomer Edwin Hubble, and is one of NASA's Great Observatories, along with the Compton Gamma Ray Observatory, the Chandra X-ray Observatory, and the Spitzer Space Telescope. With a 2.4-meter (7.9 ft) mirror, Hubble's four main instruments observe in the near ultraviolet, visible, and near infrared spectra. Hubble's orbit outside the distortion of Earth's atmosphere allows it to take extremely high-resolution images, with substantially lower background light than ground-based telescopes. Hubble has recorded some of the most detailed visible light images ever, allowing a deep view into space and time. Many Hubble observations have led to breakthroughs in astrophysics, such as accurately determining the rate of expansion of the universe. 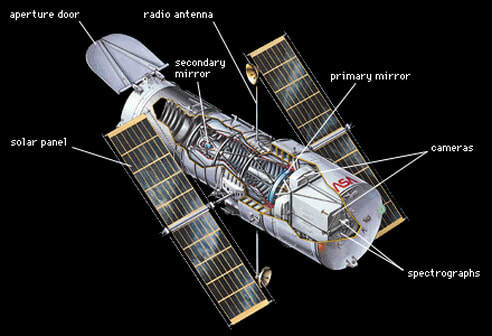 Hubble is the only telescope designed to be serviced in space by astronauts. After launch by Space Shuttle Discovery in 1990, five subsequent Space Shuttle missions repaired, upgraded, and replaced systems on the telescope, including all five of the main instruments. The fifth mission was initially canceled on safety grounds following the Columbia disaster (2003). However, after spirited public discussion, NASA administrator Mike Griffin approved the fifth servicing mission, completed in 2009. The telescope is operating as of 2017, and could last until 2030–2040. Its scientific successor, the James Webb Space Telescope (JWST), is scheduled for launch in 2019. No pressure. When pressed for better guidance, Musk said the government must get a better understanding of the latest achievements in artificial intelligence before it’s too late. “Once there is awareness, people will be extremely afraid, as they should be,” Musk said. 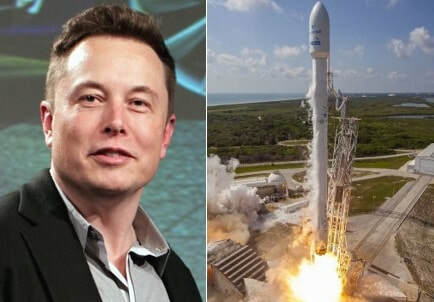 Maybe it’s already loose: "Better safe than sorry"
Elon Reeve Musk (born June 28, 1971) is a South African-born business magnate, investor, engineer, and inventor. Musk is the founder, CEO, and CTO of SpaceX; a co-founder, Series A investor, CEO, and product architect of Tesla Inc.; co-chairman of OpenAI; and founder and CEO of Neuralink. As of October 2017, Musk has an estimated net worth of $20.8 billion, ranking in the 2017 Forbes 400 as the 21st wealthiest person in America. In March 2016, he was listed by Forbes as the 80th-wealthiest person in the world. In December 2016, Musk was ranked 21st on the Forbes list of The World's Most Powerful People. Musk has stated that the goals of SolarCity, Tesla, and SpaceX revolve around his vision to change the world and humanity. His goals include reducing global warming through sustainable energy production and consumption, and reducing the "risk of human extinction" by "making life multi-planetary" by establishing a human colony on Mars. Musk also founded The Boring Company in 2016. SpaceX has done it again! ​Thousands of onlookers in Florida could be heard cheering on the company's livestream, which was viewed by about 3 million people. On board the rocket that's now headed deeper into space is Musk's personal Tesla (TSLA) roadster. At the wheel is a dummy dressed in a spacesuit. Musk said in December the car would play David Bowie's "Space Oddity" on repeat. Cameras on board the car show it cruising by Earth, which appears as a big blue orb in the background. Musk plans to send the car into orbit around the sun. ​Those rockets have a single first-stage booster, and SpaceX has safely recaptured them after 21 Falcon 9 launches. Note: the Falcon Heavy is not the most powerful rocket in history. That honor belongs to NASA's Saturn V rocket, which was used for the Apollo moon landings and was retired in the 1970s. * - Explore this Mars panorama in 360-degrees by moving the view with your mouse or mobile device. This mid-afternoon, 360-degree panorama was acquired by the Mast Camera (Mastcam) on NASA's Curiosity Mars rover on April 4, 2016. The scene is presented with a color adjustment that approximates white balancing, to resemble how the rocks and sand would appear under daytime lighting conditions on Earth. A related but distinct subject, physical cosmology, is concerned with studying the Universe as a whole. Astronomy is one of the oldest sciences. The early civilizations in recorded history, such as the Babylonians, Greeks, Indians, Egyptians, Nubians, Iranians, Chinese, and Maya performed methodical observations of the night sky. Historically, astronomy has included disciplines as diverse as astrometry, celestial navigation, observational astronomy and the making of calendars, but professional astronomy is nowadays often considered to be synonymous with astrophysics. Observational astronomy is focused on acquiring data from observations of astronomical objects, which is then analyzed using basic principles of physics. Theoretical astronomy is oriented toward the development of computer or analytical models to describe astronomical objects and phenomena. The two fields complement each other, with theoretical astronomy seeking to explain the observational results and observations being used to confirm theoretical results. Spaceflight became part of human achievement in the 20th century following theoretical and practical breakthroughs by Konstantin Tsiolkovsky and Robert H. Goddard. The Soviet Union took the lead in the post-war Space Race, launching the first satellite, the first man and the first woman into orbit. The United States caught up with, and then passed, their Soviet rivals during the mid-1960s, landing the first man on the Moon in 1969. In the same period, France, the United Kingdom, Japan and China were concurrently developing more limited launch capabilities. Following the end of the Space Race, spaceflight has been characterised by greater international co-operation, cheaper access to low Earth orbit and an expansion of commercial ventures. Interplanetary probes have visited all of the planets in the Solar System, and humans have remained in orbit for long periods aboard space stations such as Mir and the ISS. Most recently, China has emerged as the third nation with the capability to launch independent manned missions, whilst operators in the commercial sector have developed re-usable booster systems and craft launched from airborne platforms. At the beginning of the 20th century, there was a burst of scientific investigation into interplanetary travel, inspired by fiction by writers such as Jules Verne (From the Earth to the Moon, Around the Moon) and H.G. Wells (The First Men in the Moon, The War of the Worlds). The first realistic proposal of spaceflight goes back to Konstantin Tsiolkovsky. His most famous work, "Исследование мировых пространств реактивными приборами" (Issledovanie mirovikh prostranstv reaktivnimi priborami, or The Exploration of Cosmic Space by Means of Reaction Devices), was published in 1903, but this theoretical work was not widely influential outside Russia. Spaceflight became an engineering possibility with the work of Robert H. Goddard's publication in 1919 of his paper "A Method of Reaching Extreme Altitudes", where his application of the de Laval nozzle to liquid fuel rockets gave sufficient power for interplanetary travel to become possible. This paper was highly influential on Hermann Oberth and Wernher Von Braun, later key players in spaceflight. In 1929, the Slovene officer Hermann Noordung was the first to imagine a complete space station in his book The Problem of Space Travel. ​The first rocket to reach space was a German V-2 rocket, on a vertical test flight in June 1944. After the war ended, the research and development branch of the (British) Ordinance Office organised Operation Backfire which, in October 1945, assembled enough V-2 missiles and supporting components to enable the launch of three (possibly four, depending on source consulted) of them from a site near Cuxhaven in northern Germany. Although these launches were inclined and the rockets didn't achieve the altitude necessary to be regarded as sub-orbital spaceflight, the Backfire report remains the most extensive technical documentation of the rocket, including all support procedures, tailored vehicles and fuel composition. Subsequently, the British Interplanetary Society proposed an enlarged man-carrying version of the V-2 called Megaroc. The plan, written in 1946, envisaged a three-year development programme culminating in the launch of test pilot Eric Brown on a sub-orbital mission in 1949. The decision by the Ministry of Supply under Attlee's government to concentrate on research into nuclear power generation and sub-sonic passenger jet aircraft over supersonic atmospheric flight and spaceflight delayed the introduction of both of the latter (although only by a year in the case of supersonic flight, as the data from the Miles M.52 was handed to Bell Aircraft. Click here for a List of NASA Missions. President Dwight D. Eisenhower established NASA in 1958 with a distinctly civilian (rather than military) orientation encouraging peaceful applications in space science. The National Aeronautics and Space Act was passed on July 29, 1958, disestablishing NASA's predecessor, the National Advisory Committee for Aeronautics (NACA). The new agency became operational on October 1, 1958. Since that time, most US space exploration efforts have been led by NASA, including the Apollo Moon landing missions, the Skylab space station, and later the Space Shuttle. Currently, NASA is supporting the International Space Station and is overseeing the development of the Orion Multi-Purpose Crew Vehicle, the Space Launch System and Commercial Crew vehicles. The agency is also responsible for the Launch Services Program (LSP) which provides oversight of launch operations and countdown management for unmanned NASA launches. and researching astrophysics topics, such as the Big Bang, through the Great Observatories and associated programs. Click here for a List of Observatories around the Globe. are examples of disciplines for which observatories have been constructed. Historically, observatories were as simple as containing an astronomical sextant (for measuring the distance between stars) or Stonehenge (which has some alignments on astronomical phenomena). While other sciences, such as volcanology and meteorology, also use facilities called observatories for research and observations, this list is limited to observatories that are used to observe celestial objects. Many modern telescopes and observatories are located in space to observe astronomical objects in wavelengths of the electromagnetic spectrum that cannot penetrate the Earth's atmosphere (such as ultraviolet radiation, X-rays, and gamma rays) and are thus impossible to observe using ground-based telescopes. Being above the atmosphere, these space observatories can also avoid the effects of atmospheric turbulence that plague ground based telescopes, although new generations of adaptive optics telescopes have since then dramatically improved the situation on the ground. The space high vacuum environment also frees the detectors from the ancestral diurnal cycle due to the atmospheric blue light background of the sky, thereby increasing significantly the observation time. An intermediate variant is the airborne observatory, specialized in the infrared wavelengths of the EM spectrum, that conduct observations above the part of the atmosphere containing water vapor that absorbs them, in the stratosphere. Historically, astronomical observatories consisted generally in a building or group of buildings where observations of astronomical objects such as sunspots, planets, asteroids, comets, stars, nebulae, and galaxies in the visible wavelengths of the electromagnetic spectrum were conducted. At first, for millennia, astronomical observations have been made with naked eyes. Then with the discovery of optics, with the help of different types of refractor telescopes and later with reflector telescopes. Their use allowed to dramatically increase both the collecting power and limit of resolution, thus the brightness, level of detail and apparent angular size of distant celestial objects allowing them to be better studied and understood. Following the development of modern physics, new ground based facilities have been constructed to conduct research in the radio and microwave wavelengths of the electromagnetic spectrum, with radio telescopes and dedicated microwave telescopes. Modern astrophysics has extended the field of study of celestial bodies to non electromagnetic vectors, such as neutrinos, neutrons and cosmic-rays or gravitational waves. Thus new types of observatories have been developed. Interferometers are at the core of gravitational wave detectors. In order to limit the natural or artificial background noise, most particle detector based observatories are built deep underground. Click here for a List of Planetariums worldwide. A planetarium is a theater built primarily for presenting educational and entertaining shows about astronomy and the night sky, or for training in celestial navigation. A dominant feature of most planetariums is the large dome-shaped projection screen onto which scenes of stars, planets and other celestial objects can be made to appear and move realistically to simulate the complex 'motions of the heavens'. The celestial scenes can be created using a wide variety of technologies, for example precision-engineered 'star balls' that combine optical and electro-mechanical technology, slide projector, video and full dome projector systems, and lasers. Whatever technologies are used, the objective is normally to link them together to provide an accurate relative motion of the sky. Typical systems can be set to display the sky at any point in time, past or present, and often to show the night sky as it would appear from any point of latitude on Earth. Planetariums range in size from the Hayden Planetarium's 21-meter dome seating 423 people, to three-meter inflatable portable domes where children sit on the floor. Such portable planetaria serve education programs outside of the permanent installations of museums and science centers. Neil deGrasse Tyson (born October 5, 1958) is an American astrophysicist, author, and science communicator. Since 1996, he has been the Frederick P. Rose Director of the Hayden Planetarium at the Rose Center for Earth and Space in New York City. The center is part of the American Museum of Natural History, where Tyson founded the Department of Astrophysics in 1997 and has been a research associate in the department since 2003. From 1995 to 2005, Tyson wrote monthly essays in the "Universe" column for Natural History magazine, some of which were later published in his books Death by Black Hole (2007) and Astrophysics for People in a Hurry (2017). During the same period, he wrote a monthly column in Star Date magazine, answering questions about the universe under the pen name "Merlin". Material from the column appeared in his books Merlin's Tour of the Universe (1998) and Just Visiting This Planet (1998). Tyson served on a 2001 government commission on the future of the U.S. aerospace industry, and on the 2004 Moon, Mars and Beyond commission. He was awarded the NASA Distinguished Public Service Medal in the same year. From 2006 to 2011, Tyson hosted the television show NOVA ScienceNow on PBS. Since 2009, Tyson hosted the weekly podcast StarTalk. A spin-off, also called StarTalk, began airing on National Geographic in 2015. In 2014, Tyson hosted the television series Cosmos: A Spacetime Odyssey, a successor to Carl Sagan's 1980 series Cosmos: A Personal Voyage. The U.S. National Academy of Sciences awarded Tyson the Public Welfare Medal in 2015 for his "extraordinary role in exciting the public about the wonders of science". Stephen William Hawking, CH, CBE, FRS, FRSA (born 8 January 1942) is an English theoretical physicist, cosmologist, author and Director of Research at the Centre for Theoretical Cosmology within the University of Cambridge. His scientific works include a collaboration with Roger Penrose on gravitational singularity theorems in the framework of general relativity and the theoretical prediction that black holes emit radiation, often called Hawking radiation. Hawking was the first to set out a theory of cosmology explained by a union of the general theory of relativity and quantum mechanics. He is a vigorous supporter of the many-worlds interpretation of quantum mechanics. Hawking is an Honorary Fellow of the Royal Society of Arts, a lifetime member of the Pontifical Academy of Sciences, and a recipient of the Presidential Medal of Freedom, the highest civilian award in the US. ​* -- Carl Sagan gives the best speech ever about humanity and how foolish we behave. Pale Blue Dot is one of the most important and reflective speeches about the human condition and our place in the Universe. The Pale Blue Dot is a photograph of Earth taken in 1990 by the Voyager 1 space probe from a record distance of about 6 billion kilometers from Earth, as part of the solar system Family Portrait series of images. He is best known for his work as a science popularizer and communicator. His best known scientific contribution is research on extraterrestrial life, including experimental demonstration of the production of amino acids from basic chemicals by radiation. Sagan assembled the first physical messages sent into space: the Pioneer plaque and the Voyager Golden Record, universal messages that could potentially be understood by any extraterrestrial intelligence that might find them. Sagan argued the now accepted hypothesis that the high surface temperatures of Venus can be attributed to and calculated using the greenhouse effect. Sagan published more than 600 scientific papers and articles and was author, co-author or editor of more than 20 books. He wrote many popular science books, such as The Dragons of Eden, Broca's Brain and Pale Blue Dot, and narrated and co-wrote the award-winning 1980 television series Cosmos: A Personal Voyage. The most widely watched series in the history of American public television, Cosmos has been seen by at least 500 million people across 60 different countries. The book Cosmos was published to accompany the series. He also wrote the science fiction novel Contact, the basis for a 1997 film of the same name. His papers, containing 595,000 items, are archived at The Library of Congress. Sagan always advocated scientific skeptical inquiry and the scientific method, pioneered exobiology and promoted the Search for Extra-Terrestrial Intelligence (SETI). He spent most of his career as a professor of astronomy at Cornell University, where he directed the Laboratory for Planetary Studies. Sagan and his works received numerous awards and honors, including the NASA Distinguished Public Service Medal, the National Academy of Sciences Public Welfare Medal, the Pulitzer Prize for General Non-Fiction for his book The Dragons of Eden, and, regarding Cosmos: A Personal Voyage, two Emmy Awards, the Peabody Award and the Hugo Award. ​He married three times and had five children. After suffering from myelodysplasia, Sagan died of pneumonia at the age of 62, on December 20, 1996. NASA'a Voyager Space Program: including a New York Times article about the Voyager: "A Reverie for the Voyager Probes, Humanity’s Calling Cards"
"In the shadow, one might say, of the Great American Eclipse, a major anniversary in the history of space exploration — and indeed cosmic consciousness — is being celebrated. What resulted was nothing less than a re-imagining of what a world might be and what strange cribs of geology and chemistry might give rise to life in some form or other. Back then, we were looking forward to an exploration of space that would go on forever. It was magic, and we were all on the spaceship." The Voyager program is an American scientific program that employs two robotic probes, Voyager 1 and Voyager 2, to study the outer Solar System. 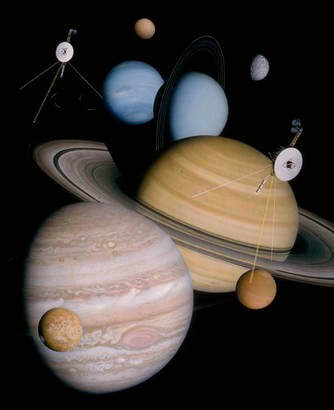 The probes were launched in 1977 to take advantage of a favorable alignment of Jupiter, Saturn, Uranus and Neptune. Although their original mission was to study only the planetary systems of Jupiter and Saturn, Voyager 2 continued on to Uranus and Neptune. The Voyagers now explore the outer boundary of the heliosphere in interstellar space; their mission has been extended three times and they continue to transmit useful scientific data. Neither Uranus nor Neptune has been visited by a probe other than Voyager 2. On 25 August 2012, data from Voyager 1 indicated that it had become the first human-made object to enter interstellar space, traveling "further than anyone, or anything, in history". As of 2013, Voyager 1 was moving with a velocity of 17 kilometers per second (11 mi/s) relative to the Sun. Data and photographs collected by the Voyagers' cameras, magnetometers and other instruments, revealed unknown details about each of the four giant planets and their moons. Close-up images from the spacecraft charted Jupiter’s complex cloud forms, winds and storm systems and discovered volcanic activity on its moon Io. Saturn’s rings were found to have enigmatic braids, kinks and spokes and to be accompanied by myriad "ringlets". At Uranus, Voyager 2 discovered a substantial magnetic field around the planet and ten more moons. Its flyby of Neptune uncovered three rings and six hitherto unknown moons, a planetary magnetic field and complex, widely distributed auroras. Voyager 2 is the only spacecraft to have visited the two ice giants. The Voyager spacecraft were built at the Jet Propulsion Laboratory in Southern California and they were funded by the National Aeronautics and Space Administration (NASA), which also financed their launches from Cape Canaveral, Florida, their tracking and everything else concerning the probes. YouTube Video: Curiosity Rover Report (August 2015): Three Years on Mars! Curiosity was launched from Cape Canaveral on November 26, 2011, at 15:02 UTC aboard the MSL spacecraft and landed on Aeolis Palus in Gale Crater on Mars on August 6, 2012, 05:17 UTC. The Bradbury Landing site was less than 2.4 km (1.5 mi) from the center of the rover's touchdown target after a 560 million km (350 million mi) journey. The rover's goals include an investigation of the Martian climate and geology; assessment of whether the selected field site inside Gale Crater has ever offered environmental conditions favorable for microbial life, including investigation of the role of water; and planetary habitability studies in preparation for human exploration. In December 2012, Curiosity's two-year mission was extended indefinitely. On August 5, 2017, NASA celebrated the fifth anniversary of the Curiosity rover landing and related exploratory accomplishments on the planet Mars. The rover is still operational, and as of June 25, 2018, Curiosity has been on Mars for 2092 sols (2149 total days) since landing on August 6, 2012. Curiosity's design will serve as the basis for the planned Mars 2020 rover. CCAFS is headquartered at the nearby Patrick Air Force Base, and located on Cape Canaveral in Brevard County, Florida, CCAFS. The station is the primary launch head of America's Eastern Range with three launch pads currently active (Space Launch Complexes 37B, 40, and 41). Popularly known as "Cape Kennedy" from 1963 to 1973, and as "Cape Canaveral" from 1949 to 1963 and from 1973 to the present, the facility is south-southeast of NASA's Kennedy Space Center on adjacent Merritt Island, with the two linked by bridges and causeways. The Cape Canaveral Air Force Station Skid Strip provides a 10,000-foot (3,000 m) runway close to the launch complexes for military airlift aircraft delivering heavy and outsized payloads to the Cape. and first three-man U.S. spacecraft (1968). and the first spacecraft to leave the Solar System (1977). Portions of the base have been designated a National Historic Landmark for their association with the early years of the American space program. (InSight is more than a Mars mission. Its team members hope to unlock the mysteries of the formation and evolution of rocky planets, including Earth. For more about the mission, click here. Pictured below: A Ticket to Explore JPL is an annual event where NASA’s Jet Propulsion Laboratory in Pasadena, California, opens its doors to the public once a year. Visitors are offered a behind-the-scenes look and interactive demonstrations. You must reserve tickets for JPL’s Open House in advance. Other opportunities to experience JPL include their monthly von Karman Lecture series and weekday JPL Tours. The Jet Propulsion Laboratory (JPL) is a federally funded research and development center and NASA field center in Pasadena, California, with large portions of the campus in La Cañada Flintridge, California. Founded in 1930s, the JPL is currently owned by NASA and managed by the nearby California Institute of Technology (Caltech) for NASA. The laboratory's primary function is the construction and operation of planetary robotic spacecraft, though it also conducts Earth-orbit and astronomy missions. It is also responsible for operating NASA's Deep Space Network. and the Spitzer Space Telescope. JPL is also responsible for managing the JPL Small-Body Database, and provides physical data and lists of publications for all known small Solar System bodies. 30th Launch Group: is responsible for booster and satellite technical oversight and launch processing activities to include launch, integration and test operations. The group consists of an integrated military, civilian and contractor team with more than 250 personnel directly supporting operations from the Western Range. 30th Operations Group: provides the core capability for West Coast spacelift and range operations. Operations professionals are responsible for operating and maintaining the Western Range for spacelift, missile test launch, aeronautical and space surveillance missions. The Space and Missile Heritage Center is located at Space Launch Complex 10, site of the first IRBM tests of the Thor and Discoverer (aka Corona spy satellite) series of launches. It is Vandenberg's only National Historic Landmark that is open for regularly scheduled tours through the 30th Space Wing's Public Affairs office. The Center preserves and displays artifacts and memorabilia to interpret the evolution of missile and spacelift activity at Vandenberg from the beginning of the Cold War through current non-classified developments in military, commercial, and scientific space endeavors. The beginning of the end of the shuttle era commenced with the lift-off of Atlantis and its crew of 4 at 11:29am EDT July 8, 2011. Click here for a List of Space Shuttle Missions. Click here for a List of Space Shuttle Crews. ​The Space Shuttle program was the fourth human spaceflight program carried out by the National Aeronautics and Space Administration (NASA), which accomplished routine transportation for Earth-to-orbit crew and cargo from 1981 to 2011. Its official name, Space Transportation System (STS), was taken from a 1969 plan for a system of reusable spacecraft of which it was the only item funded for development. The Shuttle is the only winged manned spacecraft to have achieved orbit and landing, and the only reusable manned space vehicle that has ever made multiple flights into orbit (the Russian shuttle Buran was very similar and was designed to have the same capabilities but made only one unmanned spaceflight before it was cancelled). The Shuttle missions involved carrying large payloads to various orbits (including segments to be added to the International Space Station (ISS)), providing crew rotation for the space station, and performing service missions. The orbiter also recovered satellites and other payloads (e.g., from the ISS) from orbit and returned them to Earth, though its use in this capacity was rare. Each vehicle was designed with a projected lifespan of 100 launches, or 10 years' operational life, though original selling points on the shuttles were over 150 launches and over a 15-year operational span with a 'launch per month' expected at the peak of the program, but extensive delays in the development of the International Space Station never created such a peak demand for frequent flights. Although the concept had been explored since the late 1960s, the program formally commenced in 1972, and was the sole focus of NASA's manned operations after the final Apollo and Skylab flights in the mid-1970s. The Shuttle was originally conceived of and presented to the public in 1972 as a 'Space Truck' which would, among other things, be used to build a United States space station in low Earth orbit during the 1980s and then be replaced by a new vehicle by the early 1990s. The stalled plans for a U.S. space station evolved into the International Space Station and were formally initiated in 1983 by U.S. President Ronald Reagan, but the ISS suffered from long delays, design changes and cost over-runs and forced the service life of the Space Shuttle to be extended several times until 2011 when it was finally retired—serving twice as long than it was originally designed to do. In 2004, according to the President George W. Bush's Vision for Space Exploration, use of the Space Shuttle was to be focused almost exclusively on completing assembly of the ISS, which was far behind schedule at that point. The first experimental orbiter Enterprise was a high-altitude glider, launched from the back of a specially modified Boeing 747, only for initial atmospheric landing tests (ALT). Enterprise's first test flight was on February 18, 1977, only five years after the Shuttle program was formally initiated; leading to the launch of the first space-worthy shuttle Columbia on April 12, 1981 on STS-1. The Space Shuttle program finished with its last mission, STS-135 flown by Atlantis, in July 2011, retiring the final Shuttle in the fleet. The Space Shuttle program formally ended on August 31, 2011. Since the Shuttle's retirement, many of its original duties are performed by an assortment of government and private vessels. The European ATV Automated Transfer Vehicle supplied the ISS between 2008 and 2015. Classified military missions are being flown by the US Air Force's unmanned space plane, the X-37B. By 2012, cargo to the International Space Station was already being delivered commercially under NASA's Commercial Resupply Services by SpaceX's partially reusable Dragon spacecraft, followed by Orbital Sciences' Cygnus spacecraft in late 2013. Crew service to the ISS is currently provided by the Russian Soyuz while work on the Commercial Crew Development program proceeds; the first crewed flight of this is planned for December 2018, on the SpaceX Falcon 9 with Dragon 2 crew capsule. For missions beyond low Earth orbit, NASA is building the Space Launch System and the Orion spacecraft. The Space Shuttle was a partially reusable low Earth orbital spacecraft system operated by the U.S. National Aeronautics and Space Administration (NASA), as part of the Space Shuttle program (above). The space shuttle's official program name was Space Transportation System (STS), taken from a 1969 plan for a system of reusable spacecraft of which it was the only item funded for development. The first of four orbital test flights occurred in 1981, leading to operational flights beginning in 1982. In addition to the prototype whose completion was cancelled, five complete Shuttle systems were built and used on a total of 135 missions from 1981 to 2011, launched from the Kennedy Space Center (KSC) in Florida. Operational missions launched numerous satellites, interplanetary probes, and the Hubble Space Telescope (HST); conducted science experiments in orbit; and participated in construction and servicing of the International Space Station. The Shuttle fleet's total mission time was 1322 days, 19 hours, 21 minutes and 23 seconds. The Space Shuttle was launched vertically, like a conventional rocket, with the two SRBs operating in parallel with the OV's three main engines, which were fueled from the ET. The SRBs were jettisoned before the vehicle reached orbit, and the ET was jettisoned just before orbit insertion, which used the orbiter's two Orbital Maneuvering System (OMS) engines. At the conclusion of the mission, the orbiter fired its OMS to de-orbit and re-enter the atmosphere. The orbiter then glided as a spaceplane to a runway landing, usually to the Shuttle Landing Facility at Kennedy Space Center, Florida or Rogers Dry Lake in Edwards Air Force Base, California. After landing at Edwards, the orbiter was flown back to the KSC on the Shuttle Carrier Aircraft, a specially modified version of the Boeing 747. A fifth operational (and sixth in total) orbiter, Endeavour, was built in 1991 to replace Challenger. The Space Shuttle was retired from service upon the conclusion of Atlantis's final flight on July 21, 2011. The U.S. has since relied primarily on the Russian Soyuz spacecraft to transport supplies and astronauts to the International Space Station. On January 28, 1986, the NASA shuttle orbiter mission STS-51-L and the tenth flight of Space Shuttle Challenger (OV-99) broke apart 73 seconds into its flight, killing all seven crew members, which consisted of five NASA astronauts and two payload specialists. The spacecraft disintegrated over the Atlantic Ocean, off the coast of Cape Canaveral, Florida, at 11:39 EST. The disintegration of the vehicle began after a joint in its right solid rocket booster (SRB) failed at liftoff. The failure was caused by the failure of O-ring seals used in the joint that were not designed to handle the unusually cold conditions that existed at this launch. The crew compartment and many other vehicle fragments were eventually recovered from the ocean floor after a lengthy search and recovery operation. The exact timing of the death of the crew is unknown; several crew members are known to have survived the initial breakup of the spacecraft. The shuttle had no escape system, and the impact of the crew compartment with the ocean surface was too violent to be survivable. The disaster resulted in a 32-month hiatus in the shuttle program and the formation of the Rogers Commission, a special commission appointed by United States President Ronald Reagan to investigate the accident. The Rogers Commission found NASA's organizational culture and decision-making processes had been key contributing factors to the accident, with the agency violating its own safety rules. NASA managers had known since 1977 that contractor Morton-Thiokol's design of the SRBs contained a potentially catastrophic flaw in the O-rings, but they had failed to address this problem properly. NASA managers also disregarded warnings from engineers about the dangers of launching posed by the low temperatures of that morning, and failed to adequately report these technical concerns to their superiors. NASA History Office. "Challenger STS 51-L Accident". NASA. Retrieved November 20, 2006. NASA Kennedy Space Center. "Sequence of Major Events of the Challenger Accident". NASA. Retrieved July 12, 2011. Harwood, William; Rob Navias. "Challenger timeline". Spaceflight Now. Retrieved November 20, 2006. On February 1, 2003, the Space Shuttle Columbia disintegrated upon reentering Earth's atmosphere, killing all seven crew members. 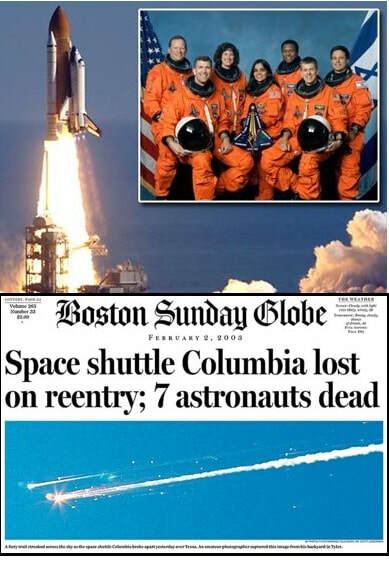 The disaster was the second fatal accident in the Space Shuttle program after Space Shuttle Challenger (see preceding topic), which broke apart and killed the seven-member crew 73 seconds after liftoff in 1986. During the launch of STS-107, Columbia's 28th mission, a piece of foam insulation broke off from the Space Shuttle external tank and struck the left wing of the orbiter. A few previous shuttle launches had seen damage ranging from minor to nearly catastrophic from foam shedding, but some engineers suspected that the damage to Columbia was more serious. NASA managers limited the investigation, reasoning that the crew could not have fixed the problem if it had been confirmed. When Columbia re-entered the atmosphere of Earth, the damage allowed hot atmospheric gases to penetrate the heat shield and destroy the internal wing structure, which caused the spacecraft to become unstable and break apart. After the disaster, Space Shuttle flight operations were suspended for more than two years, as they had been after the Challenger disaster. Construction of the International Space Station (ISS) was put on hold; the station relied entirely on the Russian Roscosmos State Corporation for resupply for 29 months until Shuttle flights resumed with STS-114 and 41 months for crew rotation until STS-121. Several technical and organizational changes were made, including adding a thorough on-orbit inspection to determine how well the shuttle's thermal protection system had endured the ascent, and keeping a designated rescue mission ready in case irreparable damage was found. Except for one final mission to repair the Hubble Space Telescope, subsequent shuttle missions were flown only to the ISS so that the crew could use it as a haven in case damage to the orbiter prevented safe reentry. The John F. Kennedy Space Center (KSC) is one of ten National Aeronautics and Space Administration field centers. Since December 1968, Kennedy Space Center has been NASA's primary launch center of human spaceflight. Launch operations for the Apollo, Skylab and Space Shuttle programs were carried out from Kennedy Space Center Launch Complex 39 and managed by KSC. Located on the east coast of Florida, KSC is adjacent to Cape Canaveral Air Force Station (CCAFS). The management of the two entities work very closely together, share resources, and even own facilities on each other's property. Though the first Apollo flights, and all Project Mercury and Project Gemini flights took off from CCAFS, the launches were managed by KSC and its previous organization, the Launch Operations Directorate. Starting with the fourth Gemini mission, the NASA launch control center in Florida (Mercury Control Center, later the Launch Control Center) began handing off control of the vehicle to the Mission Control Center shortly after liftoff; in prior missions it held control throughout the entire mission. Additionally, the center manages launch of robotic and commercial crew missions and researches food production and In-Situ Resource Utilization for off-Earth exploration. Since 2010, the center has worked to become a multi-user spaceport through industry partnerships, even adding a new launch pad (LC-39C) in 2015. There are about 700 facilities grouped across the center's 144,000 acres. Among the unique facilities at KSC are the 525 ft tall Vehicle Assembly Building for stacking NASA's largest rockets, the Operations and Checkout Building, which houses the astronaut crew quarters, and 3-mile-long Shuttle Landing Facility. There is also a Visitor Complex open to the public on site. ​Edwards Air Force Base (AFB) (IATA: EDW, ICAO: KEDW, FAA LID: EDW) is a United States Air Force installation located in Kern County in southern California, about 22 miles (35 km) northeast of Lancaster and 15 miles (24 km) east of Rosamond. Edwards AFB is the home of the Air Force Test Center, Air Force Test Pilot School, and NASA's Armstrong Flight Research Center. It is the Air Force Materiel Command center for conducting and supporting research and development of flight, as well as testing and evaluating aerospace systems from concept to combat. It is also hosts many test activities conducted by America's commercial aerospace industry.